I am wondering how much we’ll see of River in upcoming episodes. Surely we must be getting close to her time in the Library. Yes, it’s Moffat doing a JK Rowling and claiming ownership on that storyline. Thing is, while she looks good for her age Alex Kingston isn’t getting any younger and we know from established continuity that River doesn’t get any older (although he must be able to pull off some sort of trickery to get her out of the library). Similarly, they could easily tell the Jim the Fish story in flashback, although it’s now become such a meme that whatever Moffat comes up with couldn’t possibly live up to the hype, and he knows that. I know you’re not the hugest fan of her storyline, but I’d like to see what they manage to do with her before she IS too old to play the role anymore. I’m sure we haven’t seen the last of her, but I can’t imagine how much longer they can stretch it out. 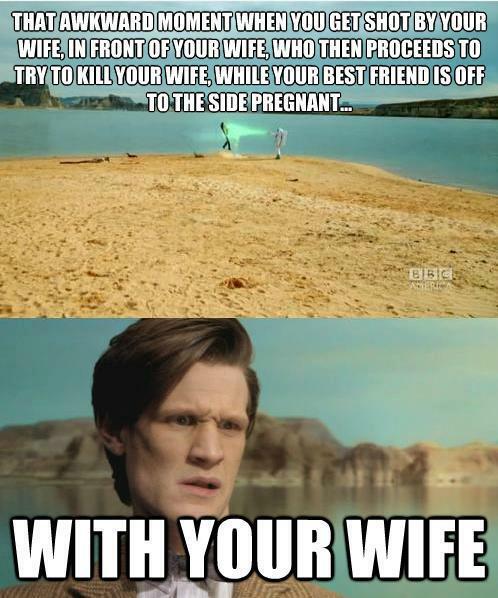 My thinking is that this is Moffat’s baby and he’s not going to be around forever. So when he bows out, he’ll take River with him, and the new chief writer will probably ignore her, in much the same way that he ignored Jack, Wilf and the god-awful irritating Tylers. I can’t be alone in hoping he leaves before Smith’s tenure is over, can I? I’d really like to see what he could get up to with someone else at the helm.